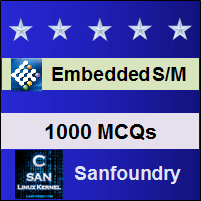 This set of Embedded Systems Multiple Choice Questions & Answers (MCQs) focuses on “I2C-I”. 1. What does I2C stand for? Explanation: The I2C is known as inter-IC, which is developed by Philips for interfacing with the peripheral devices. 2. Which company developed I2C? Explanation: The I2C is developed by Philips for use within the television sets. 3. Which of the following is the most known simple interface? Explanation: The I2C is the most known simple interface which is used currently. It can combine both the hardware and the software protocols to provide a bus interface which helps in the communication with many peripherals. 4. Which are the two lines used in the I2C? Explanation: The I2C bus consists of two lines which are called SDA and SCL. The master and slave devices are attached to these lines. 5. Which of the following developed P82B715? Explanation: The special buffer chip, P82B715 for increasing the current drive is developed by Philips. 6. Which pin provides the reference clock for the transfer of data? Explanation: The SCL pin can provide the reference clock for the transmission of data but it is not a free running clock. 7. Which of the following are the three hardware signals? Explanation: The three hardware signals are START, STOP and ACKNOWLEDGE. These signals help in the transmission of data between the slave and the masters. 8. Which of the following performs the START signal? Explanation: The START signal is performed by the master by making the SCL and SDA pin high. 9. Which of the following are handshake signals? Explanation: The START signal and ACKNOWLEDGE signals are almost similar but there exhibits a small change. The START signal is initiated by the master only but the ACKNOWLEDGE signal is a handshake between both the master and slave. Explanation: The data is transmitted in packets with a having one or more bytes. These packets of data are also known as a telegram. 11. Which of the following byte performs the slave selection? Explanation: The slave selection is performed by using the first byte as an address byte. When the address byte is sent out all the slave devices compares the address by its own value. If there is a match, the ACKNOWLEDGE signal will be sent by the slave.